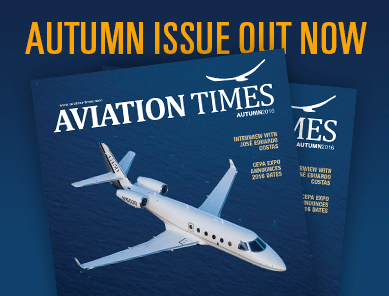 AVIATION TIMES is a digital magazine bringing you News from all areas and perspectives of aviation in Central and Eastern Europe. We at AVIATION TIMES are a selected group of professionals dedicated to provide you with news and insights on business aviation, its personalities, their activities, their businesses, and how it all comes together in the industry. We present you with the latest international news as well as essential background information, alerts, and helpful suggestions. We offer a variety of information on aircraft operation and management, airports and executive handling, financial and legal aspects, manufacturing and design, trip planning and other aviation services, events and other occurrences in the industry that we believe should be brought to your attention. The focus of AVIATION TIMES is on activities and developments in Central and Eastern Europe, but we also report on items from abroad that are of interest to the readers in our catchment area. AVIATION TIMES is established in 2013 and headquartered in Prague, Czech Republic. The magazine has a broad international audience of readers with an interest in what is happening in Central and Eastern Europe. Take your opportunity to share your corporate news, achievements, new people on board, activities, reports, press releases, and send it to us at email news(@)aviation-times.aero.